A woman had her throat squeezed, restricting her breathing, during an attack by her partner in Kirkcaldy. The victim was then prevented from leaving the house. The incident resulted in Gordon Strachan (41) of Bank Street, Kirkcaldy, appearing in the dock at Dunfermline Sheriff Court. 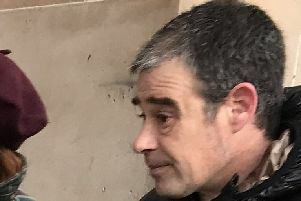 He admitted that on July 25, last year at his home he assaulted Carol Mitchell, his then partner, by struggling with her, repeatedly seizing her by the throat, compressing it and thereby restricting her breathing, all to her injury. Strachan also admitted that on the same date and place he behaved in a threatening or abusive manner by throwing a glass bottle, tipping over a table and kicking a door shut, preventing Ms Mitchell from leaving. Sheriff Craig McSherry called for reports and Strachan will be sentenced on May 21.